Our Yacht Sculpture reminds us of the boat you see in Monaco or Miami that the super-rich own. It will delight anyone in the travel or vacation industry. It’s a perfect promotional award for the sailor on your gift list. And it’s a perfect retirement gift for anyone looking forward to seeing the world. Check also our Boat Gifts category. 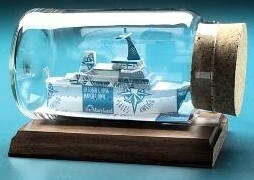 Other ships in a bottle include the Clipper Ship, Cruise Ship, Pirate Ship and Sloop.